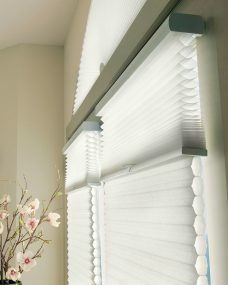 Duette Duo Tone Blinds 64 mm provides a dual purpose. Firstly, the blinds provides privacy to a room as well as allowing light to pass through. For the most part, the fabrics reflect, transmit and absorb light. The percentage rates for individual vary from fabric to fabric. However, the figures for each blind are roughly the same during tests. The large pleats, enables the blinds suitability, for long windows as well as wide ones. Generally speaking,the majority of the collection contains two colour. A main colour in addition to white. On the positive side the Duette Duo Tone Blinds provide greater energy efficiency in comparison with roller blinds. Consequently, as energy prices keep increasing, duo tone blinds, provides a way to offset the charges. During the summer, the blinds reduces the amount of heat passing through a window. The fabrics and NOT Luxaflex branded blinds. An additional selection of Duette 64 mm Blackout Blinds.